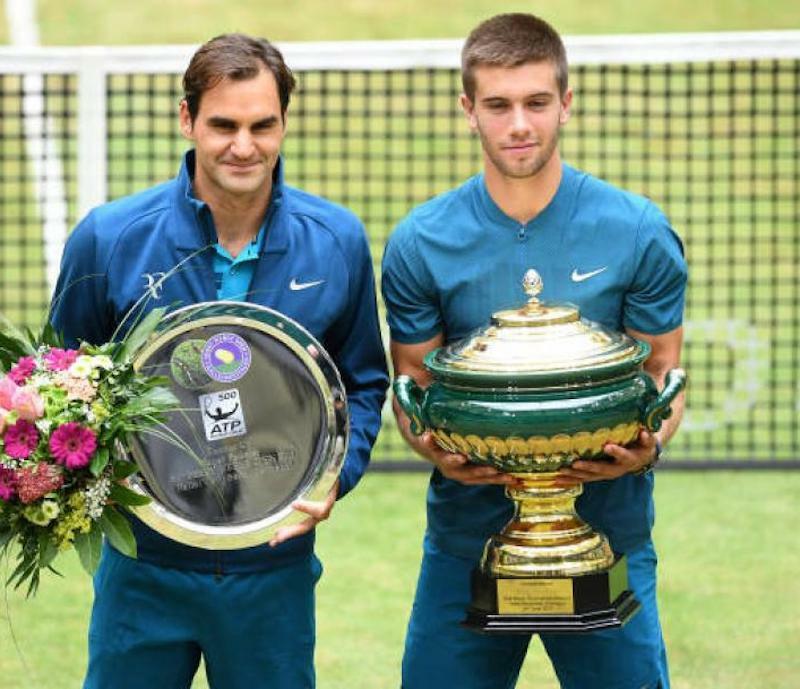 Borna Ćorić winner against Roger Federer in the finals in Halle 2018, Germany. 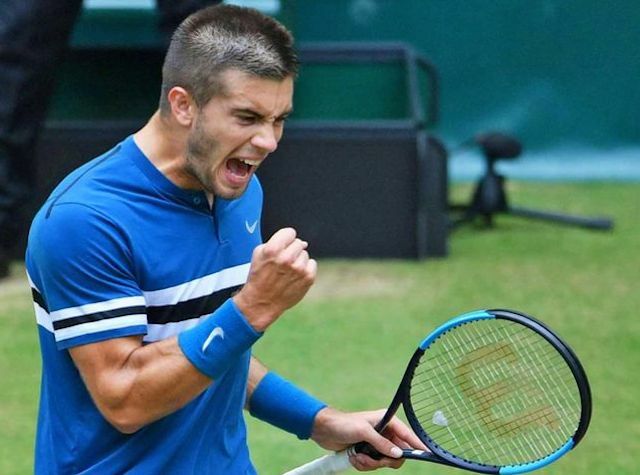 Borna Coric: This was the most unbeleivable week of my whole life. We provide a video summary of his win against Roger Federer (in the semi-finals he won agains Zverev), as well as an interview with him and a short report about his potential, described among others by Goran Ivanišević. Roger Federer until Borna's win No 1 on the ATP list. Borna Ćorić's coach is Ivan Ljubičić, distinguished former Croatian tennis player. The first known traces of tennis playing in Croatia date from 1878 (in Zagreb and Samobor). The first Davis Cup match in Croatia was played in Zagreb in 1927. In the finals of the 1939 Davis Cup match for the European zone, held in Zagreb, the Croatian team defeated the representation of Germany. The players who brought this victory were Franjo Puncec and Dragutin Mitic. This was probably the gratest international success of Croatian sport in the first half of the 20th century. Besides the USA and Australia, by the end of 1930s Croatia had the strongest Davis Cup team in the world. See Povijest tenisa u Hrvatskoj, [PDF]. Dragutin Mitic (1917) was a distinguished Croatian tennis player. In 1938 Simone Mathieu (France) and Mitic became the Roland Garros mixed double champions. In 1939, playing with Franjo Puncec, he defeated the German Davis Cup team at the European zone finals in Zagreb. From 1954 until 1965 he worked as a tennis professional in Bogota, capital of Columbia. It is interesting that his photo appears on a Colombia stamp, see below. In 1965 he immigrated to the USA. 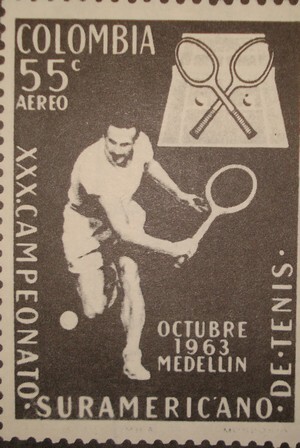 Dragutin Mitic, Croatian tennis player on a stamp in Columbia. Photo of the stamp by Vladimir Novak. Zeljko Franulovic is one of the greatest players in the history of the Croatian tennis. He was one of the most important personalities in the organizational structure of the ATP (Association of Tennis Professionals). He was the proprietor of the ATP tournament in Geneva, director of the prestigious Masters' tournament in Frankfurt. 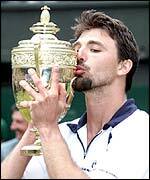 He prepared an ATP tournament held in Zagreb in 1996, where Goran Ivanisevic triumphed (the same day Iva Majoli triumphed in Tokyo; indeed, a great day for the Croatian tennis). are our best tennis players, among the top ten in the world in 1990's. 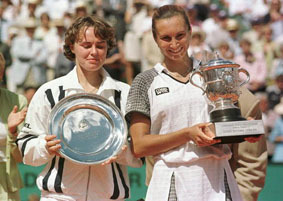 Mirjana Lucic has won the 1998 Australian Tournament in doubles at the age of 15, together with the world champion Martina Hingis. A trainer of the German Davis Cup representation is Nikola Pilic. In the finals of the 2000 Gold Coast Open Silvija Talaja beat Concita Martinez, 1994 Wimbledon Winner. In 2005 Croatia managed to win in the Davis Cup quarter-final match against very strong USA team on "their territory". 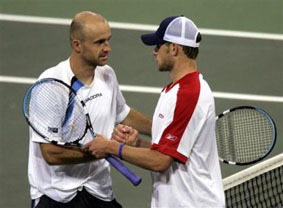 Ivan Ljubicic (Bosnian Croat born in Banja Luka) defeated Andre Agassi and Andy Roddick, and with his colleague Mario Ancic brought victory against brothers Bryan in the doubles. Until the match with Croatia in 2005 the USA Davis Cup team has never lost a round at home in 105 years of play! Furthermore, Croatia is only 12th country in history to win the Davis Cup. 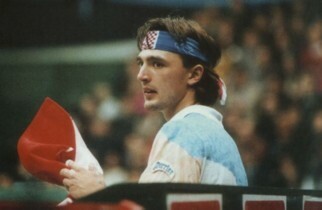 Nikola Pilic, leader of the team, thus became the first captain in the history of Davis cup to win the trophy for different nations (he led Germany to Davis Cup titles in 1988, 1989 and 1993). Marin Cilic won the 2005 Roland Garros gold medal in Paris in the junior category (at the age of 16, as one of the youngest competitors). He lost only one set in the whole tournament. Marin was born in the famous Medjugorje in Bosnia and Herzegovina. In 2017 he reached the finals of the Wimbledon tournament, loosing to R. Federer. Borna Ćorić winning against Roger Federer in Halle 2018, Germany. Photo by ATP. Distributed by www.Croatia.org . This message is intended for Croatian Associations/Institutions and their Friends in Croatia and in the World. The opinions/articles expressed on this list do not reflect personal opinions of the moderator. If the reader of this message is not the intended recipient, please delete or destroy all copies of this communication and please, let us know. (E) The New York Times - "...in Near Feudal"